Are you the kind of person who loves to bake? If so, you may feel like corn syrup is something you have to use. Now, I agree, that it is useful to many recipes – it helps the consistency of sauces and candies, adds moisture, etc, but as someone who is a proponent of healthy living and whole foods eating, I have decided it is something I simply can’t use in my cooking – my family’s health is just too valuable. So, I decided to do a search for some alternatives to corn syrup in my baking. Just what exactly is the big deal, you ask, and how can I find good substitutes? Well, first, let me say that our ancestors got along just fine without this in their baking, so there has to be an alternative, right? I am convinced that the vast level of people with inflammation (which causes a myriad of health issues, both subtle and not-so-subtle) comes from highly processed foods, which are a large part of a “modern” diet. I am a firm believer that our bodies are made to break down foods the way they grow, or in their most natural state. Back to corn syrup…. It scares me for a few different reasons. The first one is, the level of processing needed to produce syrup from corn stalks removes this from being anything at all resembling a whole food. Secondly, there are other sweeteners that contain higher levels of nutritional value and/or don’t have the same affect on your glycemic index, making them a better choice for your body (remember, that all sugars need to be used in moderation). Lastly, from what I can tell, it is nearly impossible to find corn syrup that is not made from genetically modified corn. Here are 5 corn syrup alternatives you can try in your baking. 1. Honey – as sweet foods go, raw, unpasteurized honey contains many health benefits from anti-oxidants to anti-bacterial properties to reducing hay fever to topically healing wounds. As many sweeteners in their unprocessed state, it contains minerals and nutrients that are beneficial to your body as a whole. Use honey in equal parts as a substitute for corn syrup. However, because the molecular structure of honey is slightly different than that of corn syrup, you may want to use a dash of lemon juice or cream of tartar to achieve the same consistency when making caramel or candy. 2. Maple syrup – for all its yummy, sweet goodness, maple syrup has many health benefits. It is naturally rich in minerals and other nutrients, and has a distinct, rich flavor. 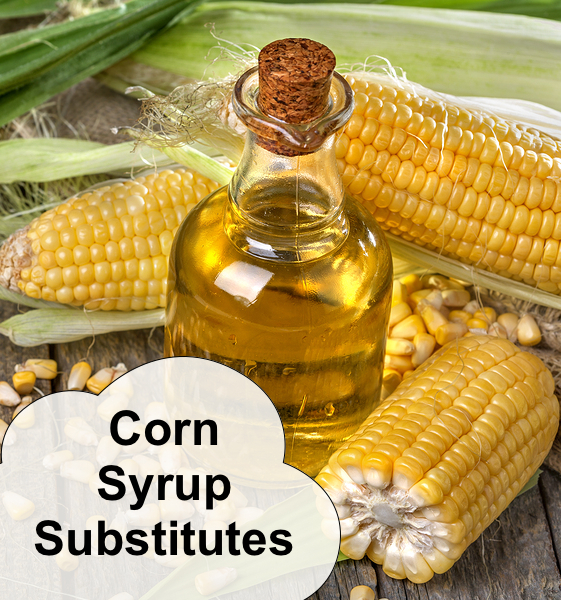 When using as a substitute for corn syrup, which is sweet, but relatively mild otherwise, be prepared to experience a richer flavor. Also, try using a dash of lemon juice or cream of tartar, like with honey, to match the same consistency as corn syrup when making caramel or candy. 3. Agave nectar – this plant-based sweetener is more processed than raw honey and pure maple syrup, however it has gained popularity because it is lower than many natural sweeteners on the glycemic index. For each cup of corn syrup in a recipe, substitute 3/4 cup agave nectar and use the dash of lemon juice or cream of tartar for consistency when making caramel or candy. As a side note, though agave nectar is actually sweeter than corn syrup, it has a mild taste, but is very high in fructose. 4. Brown rice syrup – the sugars in brown rice syrup are different than those in corn syrup, but the consistency should be very similar. Brown rice syrup contains more complex sugars, which will absorb more slowly into the bloodstream. Also, while still refined, it is much less so than corn syrup. 5. Cane sugar syrup – This might be one of the best substitutes for corn syrup in terms of flavor. To make cane sugar syrup, dissolve 1 cup of raw cane sugar in 1/2 cup of hot water. Bring cane sugar and water to a gentle boil over medium heat. Turn heat to low, and stir continuously until all the sugar is dissolved. This will take approximately 3-4 minutes. Remove from heat and let cool. This syrup can actually be stored in the refrigerator, but you may need to warm it before using it. Don’t forget that each of these substitutes have their own unique flavor, so try them out before making a big batch of your treats! Try them all and leave me your feedback. Can you make a sugar syrup out of coconut sugar?